Ashur-dan III was King of Assyria from 772 to 755 BC.Ashur-dan III was the son of Adad-nirari III, and succeeded his brother Shalmaneser IV in 773 BC. Ashur-dan's reign was a difficult age for the Assyrian monarchy. The rulership was severely limited by the influence of court dignitaries, particularly that of Shamshi-ilu, who was the commander-in-chief of the army (turtanu) at that time. According to the eponym canon, in 765 BC, Assyria was hit by a plague, and in the following year, the king could not campaign (it was customary for the Assyrian king to lead a military expedition every year). In 763 BC, a revolt broke out, which lasted until 759 BC, when another plague struck the land.His reign and the reigns of preceding Assyrian kings have been astronomically dated based on the only verifiable reference to a solar eclipse in Assyrian chronicles, the eclipse of Bur Sagale.Ashur-dan was succeeded by another brother, Ashur-nirari V.
Ashur-nirari V was King of Assyria from 755 to 745 BC. He was succeeded by Tiglath-Pileser III. Ashur-nirari V was a son of Adad-nirari III, and preceded by his brother, Ashur-dan III. He inherited a difficult situation from his predecessor. The Assyrian rulership was severely limited by the influence of court dignitaries, particularly that of Shamshi-ilu, who was the commander-in-chief (turtanu). According to the eponym canon, for four years the king was compelled to stay "in the land." It was customary for the Assyrian king to campaign every year, and such an indication usually meant the kingship had been seriously weakened. In his fourth and fifth regnal years, however, he campaigned to Namri (Namar). In 746 BC, a revolt broke out again, and in the following year the throne was seized by Tiglath-Pileser III, who may have been his brother or his son, or, alternatively, a usurper with no relationship to the previous royal house at all. The Neo-Assyrian Empire arose in the 10th century BC. Ashurnasirpal II is credited for utilizing sound strategy in his wars of conquest. While aiming to secure defensible frontiers, he would launch raids further inland against his opponents as a means of securing economic benefit, as he did when campaigning in the Levant. The result meant that the economic prosperity of the region would fuel the Assyrian war machine.Ashurnasirpal II was succeeded by Shalmaneser III. Although he campaigned for 31 years of his 35-year reign, he failed to achieve or equal the conquests of his predecessor, and his death led to another period of weakness in Assyrian rule.Assyria would later recover under Tiglath-Pileser III, whose reforms once again made Assyria the most powerful force in the Near East, and transformed it into a fully fledged empire – the first of its kind. Later, under Shalmaneser V, Sargon II and Sennacherib, further Assyrian offensives occurred, although these were designed not only for conquest, but also to destroy the enemies ability to undermine Assyrian power. As such, costly battles raged taking tolls on Assyrian manpower. Esarhaddon succeeded in taking lower Egypt and his successor, Ashurbanipal, took the southern upper half of Egypt. However, by the end of the Ashurbanipal's reign it appears that the Assyrian Empire was falling into another period of weakness, one from which it would not escape. It appears that years of costly battles followed by constant (and almost unstoppable) rebellions meant that it was a matter of time before Assyria ran out of troops. The loss of the outer regions meant that foreign troops were gone too. By 605 BC, independent political Assyrian records vanish from history and the Assyrians lost their independence forever. 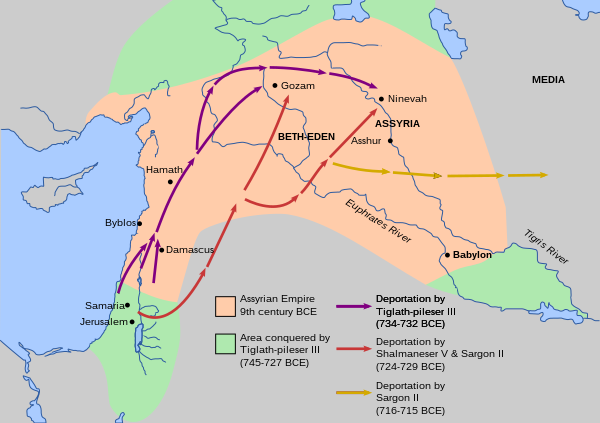 In the three centuries starting with the reign of Ashur-dan II (934-912 BCE), the Neo-Assyrian Empire practiced a policy of resettlement (also called "deportation" or "mass deportation") of population groups in its territories. The majority of the resettlements were done with careful planning by the government in order to strengthen the empire. For example, a population might be moved around to spread agricultural techniques or develop new lands. It could also be done as punishment for political enemies, as an alternative to execution. In other cases, the selected elites of a conquered territory were moved to the Assyrian empire, to enrich and increase knowledge in the empire's centre. Bustenay Oded in 1979 estimated that about 4.4 million people (± 900,000) were relocated over a 250-year period. One instance, the relocation of the Israelites in late eighth century BCE was described in Biblical passages and came to be known as the Assyrian captivity. Sennacherib was the king of Assyria from 705 BCE to 681 BCE. He is principally remembered for his military campaigns against Babylon and Judah, and for his building programs – most notably at the Akkadian capital of Nineveh. He was assassinated in obscure circumstances in 681 BCE, apparently by his eldest son (his designated successor, Esarhaddon, was the youngest).The primary preoccupation of his reign was the so-called "Babylonian problem", the refusal of the people of Babylon to accept Assyrian rule, culminating in his destruction of the city in 689 BCE. Further campaigns were carried out in Syria, in the mountains east of Assyria, against the kingdoms of Anatolia, and against the Arabs in the northern Arabian deserts. His campaigns in Syria are recorded in the Second Book of Kings in the Hebrew Bible. His death was welcomed in Babylon as divine punishment for the destruction of that city.He was also a notable builder: it was under him that Assyrian art reached its peak. His building projects included the beautification of Nineveh, a canal 50 km long to bring water to the city, and the "Palace Without Rival", which included what may have been the prototype of the legendary Hanging Gardens of Babylon, or even the actual Hanging Gardens. Shalmaneser IV was king of Assyria (783–773 BC). He succeeded his father Adad-nirari III, and was succeeded by his brother Ashur-dan III. Very little information about his reign has survived. According to the eponym canon, he led several campaigns against Urartu. His rulership was severely limited by the growing influence of high dignitaries, particularly that of Shamshi-ilu, who was then commander-in-chief of the army. Sammurāmat or Sammuramāt was a regent of Assyria between 811 and 808 BC. Sinsharishkun (also spelled Sin-shar-ishkun or Sîn-šarru-iškun, c. 627 – 612 BC) was one of the last kings of the Assyrian empire, followed only by Ashur-uballit II. He seems to have been the Saràkos mentioned by Berossus. The state communications in the Neo-Assyrian Empire allowed the Assyrian king and his officials to send and receive messages across the empire quickly and reliably. Messages were sent using a relay system (Assyrian: kalliu) which was revolutionary for the early first millennium BCE. Messages were carried by military riders who travelled on mules. At intervals the riders stopped at purpose-built stations, and the messages were passed to other riders with fresh mounts. The stations were positioned at regular intervals along the imperial highway system. Because messages could be transmitted without delay or waiting for riders to rest the system provided unprecedented communication speed, which was not surpassed in the Middle East until the introduction of the telegraph. The efficiency of the system contributed to the Neo-Assyrian Empire's dominance in the Middle East and to maintaining cohesion throughout the empire. These Assyrian innovations were adopted by later empires, including the Achaemenid Empire which inherited and expanded the Assyrian communication network. Tiglath-Pileser III (cuneiform: 𒆪𒋾𒀀𒂍𒊹𒊏 TUKUL.TI.A.É.ŠÁR.RA; Akkadian: Tukultī-apil-Ešarra, "my trust is in the son of the Ešarra"; Hebrew: תִּגְלַת פִּלְאֶסֶר Tiglat Pil’eser) was a prominent king of Assyria in the eighth century BCE (ruled 745–727 BCE) who introduced advanced civil, military, and political systems into the Neo-Assyrian Empire.TiglathᐨPileser III seized the Assyrian throne during a civil war and killed the royal family. He made sweeping changes to the Assyrian government, considerably improving its efficiency and security. He created Assyria's first professional standing army.Tiglath-Pileser III subjugated much of the Near East region; to the south, his fellow Mesopotamians in Babylonia and Chaldea, and further south still, the Arabs, Magan, Meluhha, and Dilmunites of the Arabian Peninsula. In the south west, Israel, Judah, Philistia, Samarra, Moab, Edom, the Suteans and Nabatea fell. To the north, Urartu, Armenia and Scythia in the Caucasus Mountains, Cimmeria by the Black Sea, and Nairi were subjugated, and in the north west much of eastern and south western Asia Minor, including the Hittites, Phrygia, Cilicia, Commagene, Tabal, Corduene and Caria. In the west, the Greeks of Cyprus and Aram (modern Syria), and the Mediterranean city-states of Phoenicia/Caanan were subjugated. To the east he subjugated Persia, Media, Gutium, Mannea, Cissia and Elam. Later in his reign he was crowned king in Babylonia. Tukulti-Ninurta II was King of Assyria from 891 BC to 884 BC. He was the second king of the Neo Assyrian Empire.